Many fans believe Keri Russell was cast in Star Wars 9 as Mara Jade. Others believe she is Rey's mother. Then there's that small faction who believe she could be both. There's no evidence to back any of this up, and some involved in the film have downright denied Mara Jade is in this saga ending sequel. But perhaps it's all a ruse. Franchise star Mark Hamill has infiltrated social media once again, and is suggesting that Luke Skywalker had a romantic relationship somewhere between the fall of the second Death Star and the rise of Starkiller base. When we reunite with Luke Skywalker at the end of The Force Awakens, he's a lonely old hermit sucking on sea alien milk. But perhaps it wasn't always that way. Jedi are supposed to be celibate creatures. But Luke didn't mind those rules in the books that have since been wiped from canon to become part of the Legends oeuvre. Bits and pieces of those books have made it back into the new movies. And fans are hoping that soon includes Mara Jade. "Maybe he did between Ep. 6 & 7. Many untold stories there." So after Return of the Jedi and before he started the Jedi school for wayward youths, did Luke have a tryst with someone? Was that someone Mara Jade? 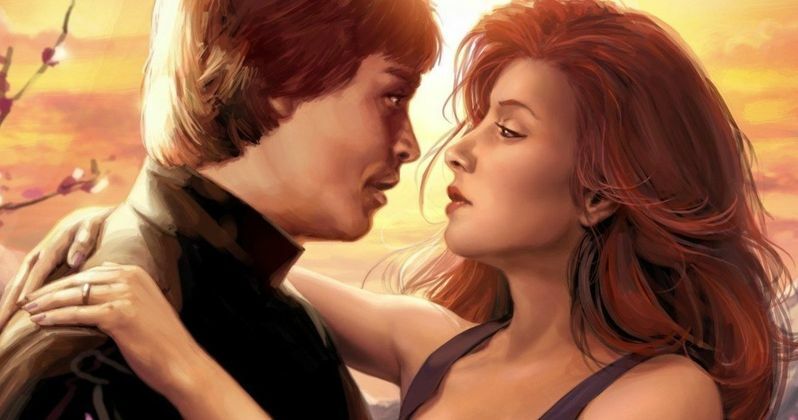 In the Legends canon, Mara Jade is Luke's wife and mother of Ben Skywalker. That conceit got twisted in the movies, with Ben becoming a Solo instead, with his new parents Han and Leia. Keri Russell makes for a nice Mara Jade in theory. But leaked intel claims Russell is actually playing a member of the First Order, and will be sidling up to Kylo Ren and General Hux. Mark Hamill is known for trolling his fans, and especially President Trump, on social media. So he might just be pulling a gag here. Or he might be talking out of places that have no mouth. Though, there always comes a huge book dump before any new Disney Star Wars movie, and we're sure to get plenty of novels in the Journey to Star Wars 9. Will any of them touch on Luke Skywalker's affair as he strays from the true Jedi lifestyle? That's very possible. The opening moments in The Last Jedi adaptation showed Luke daydreaming about a different time where he had a wife. It wasn't specifically implied that it was Mara Jade in this Force Dream. But many speculated that to be the case. From the material that has seeped out of the Lucasfilm camp so far, there is no evidence that Mara Jade is in Star Wars 9. But fans didn't know Snoke was going to get cut in half in The Last Jedi, so secrets can be kept before opening night. Will Luke get a girlfriend in the current canon? We'd like to see Luke's Force Ghost hook up with Rose Tico as a jealous Finn looks on, confiding his true love for the maintenance worker to his new alien friend and Maz Kanata's first mate on her giant pirate-like Sail Barge, Etinpi Skyvor. Only time will tell if Luke ever got lucky in this Galaxy far, far away. The important take away here is that Disney wiped away the Legends series once, they could easily scrap The Force Awakens canon, start calling it something else, and begin fresh if they really wanted too. Though, their legacy cast ain't quite in the same place it was back in 2012 when Disney bought this sprawling franchise. This little tease comes direct from Mark Hamill's Twitter.